The success of a set menu is determined by the quality of the food, the precisely planned sequence of the dishes and the table setting. WMF's collections offer high-quality cutlery in a coordinating design for each course. WMF cutlery. The gateway to a sensuous tasting experience. Designer Cornelius Boerner directs the InnoLab WMF facility and blends the usability, aesthetics and functionality of cutlery into harmonic unity. Cutlery has an effect. Visually, haptically, through to the taste experience. As part of table culture it imparts a certain character: classic, formal, rustic, minimalistic or playful. So there can’t be just one perfect set of cutlery, there must be many. I find the choice of a particular cutlery ­design particularly apt when it picks up on the statement made by the interior and the fittings, when it is a match for the occasion and the meal ­itself. That’s when aesthetic excellence and functional quality join, and their unity is a marvel. New gastronomic concepts, trends in architecture, interior and accessories – they all influence each other. And so at WMF we are very much aware of how important it is for cutlery designs to give you as a caterer precisely the sup­port you need for your concept. Even the smallest mocha spoon reflects this. Everything tastes better when eaten with well-designed cutlery. Except finger food. The classic three-piece cutlery set can accompany even the most simple of meals, though the more courses you offer your guests, the more extensive the cutlery you will need when setting the table. Therefore, our collections not only offer different designs but also an extensive range of cutlery pieces for serving and eating. Fish or steak knives and forks, dessert spoons and many other special pieces of cutlery complement the basic items in the individual ranges. The matching finish is just as important as the use of our patented cutlery material Cromargan®. The Juwel cutlery collection comes across as classically elegant and yet ultra modern. 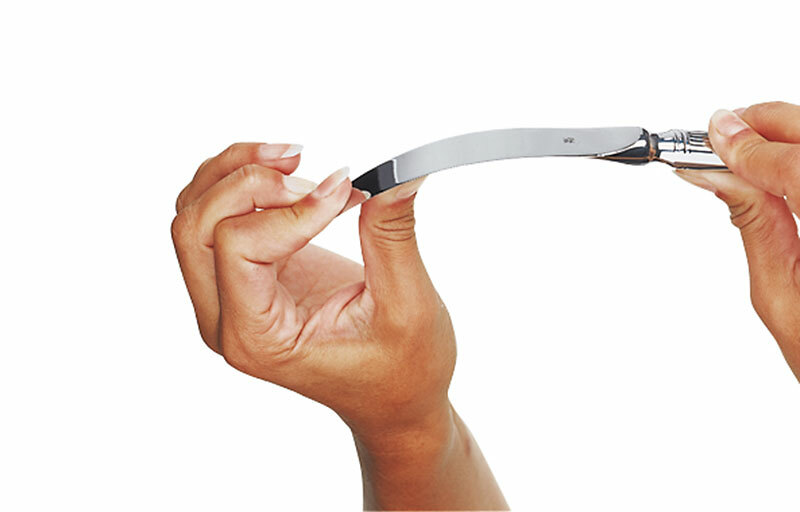 It is available in either polished Cromargan® or a silver-plated finish. The successful combination of classic elements with clear lines makes this collection the perfect accompaniment for the special event that any fine meal should be. Each piece of cutlery is well balanced and compact. This means that the meal will not just be a culinary pleasure for your guests; they will also enjoy the feel of the cutlery in their hands. Our hollow-handled knives are made from a special forged blade steel and incorporate a two-part handle made from Cromargan®, for example. Thanks to the sophisticated method we use to join together the different parts, we create dinner knives that are stable and offer long-lasting sharpness. This is the standard construction method for high-quality knives that have to meet stringent requirements. It is not just a sharp blade that makes it easy and comfortable to use a knife, and a fork consists of more than just a handle and fork prongs. 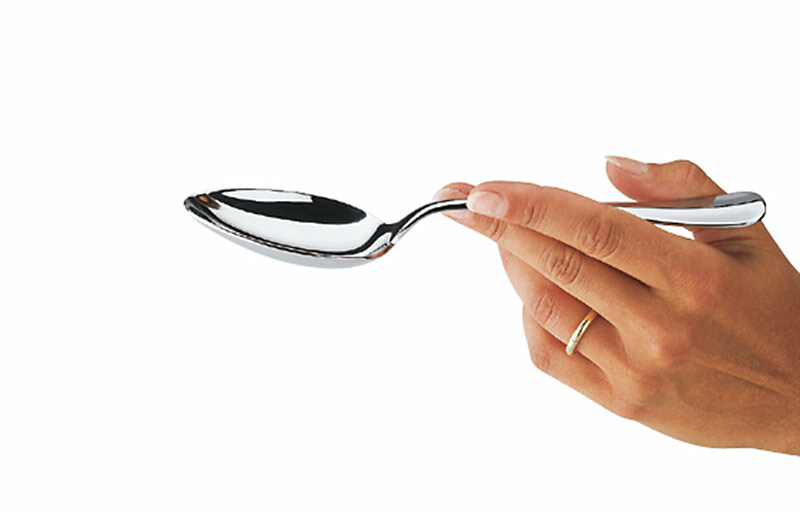 We therefore ensure that our dinner cutlery pieces are perfectly balanced. Each piece is stable yet light to hold. The lightness of the cutlery makes it even more pleasurable to use at the table and makes sure that your guests have great memories of each meal. To enjoy a meal you need the right tools. 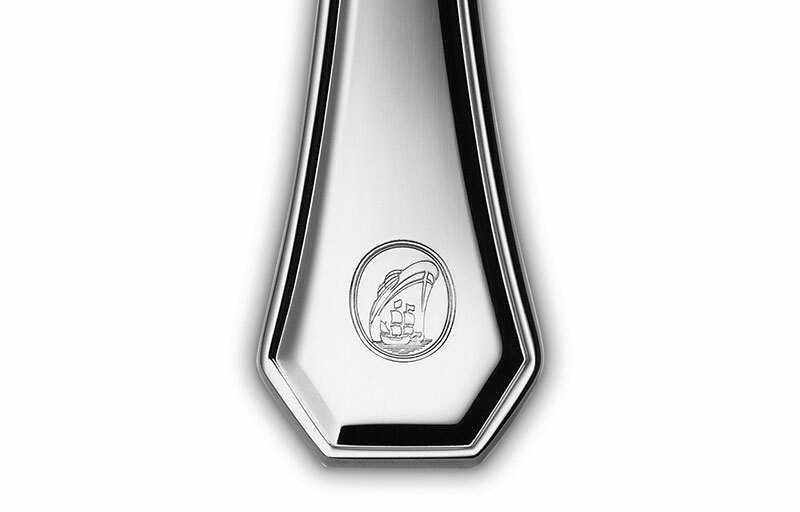 Each individual piece of WMF cutlery for the catering industry meets the highest standards. The blades of our hollow-handled knives are made from special forged blade steel. Thanks to the patented methods we use, our dinner knives have a serrated cutting edge that will remain sharp for a very long time and make it easier for your guests to cut up their food. Extremely strong, hard-wearing and acid-proof, Cromargan® is the ideal material for long-lasting cutlery that will always look beautiful. Even after frequent use, each piece still looks shiny and virtually as good as new.